This month we welcome Emily Jeffords to teach on the beautiful art of oil painting. Our members will receive the tools & materials to produce one complete abstract painting (plus many more!) with Emily's careful instruction. 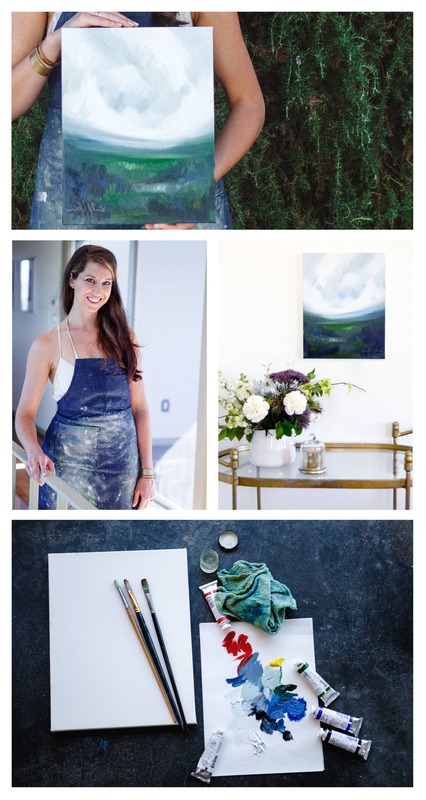 Emily Jeffords is an abstract impressionistic painter, often working in oil on canvas. She lives in Greenville, South Carolina and works out of an 1890's white-washed studio called the White Whale. Most of her days are ordered by the sunlight - painting hours carved out of life's other work, creating a haven for her imagination. The sun filters through the studio windows, bringing with it light and inspiration, speckled shadows and brightness on the floor, a floor that is also covered with canvases, paints left out by her young daughters, and the works-in-progress. "Painting brings me so much peace and gives me time to meditate on the beauty in the world and the grace I feel while living in it and my highest goal is to convey that same peace and grace to the viewer. I create art to satisfy a need deep in my soul to create, to use my hands to say, with color and form, something that my words cannot. " Emily first fell in love with painting when she realized that she could create something tangible and physical - but also emotional and spiritual - on canvas. The work she is most know for, her abstracted landscape paintings, are specifically centered on the theme of finding peace and beauty in the midst of life's changing landscape.